PRODUCT RATING Atrocious quality. Within 3 months, the boots lose their waterproofing, the soles begin to detach from uppers and the fabric tears in multiple locations. On the positive side, the fit is excellent and the boots are very comfortable. GREEN RATING Greenwash. The most important attribute of an environmentally friendly product is durability. I can imagine nothing worse than sending a product to the landfill after 3 months of use. Nevertheless, I do appreciate that the bag it came in was made of 30% recycled paper. 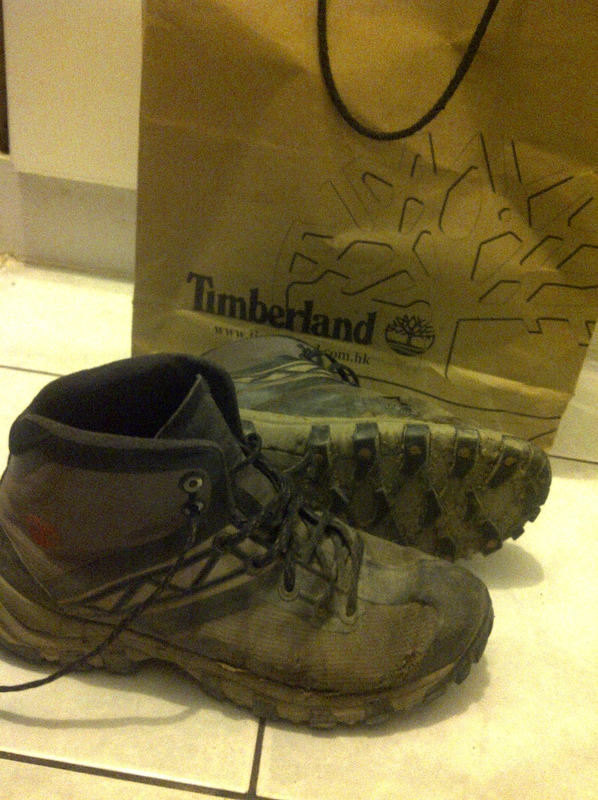 My experience with Timberland started on a very positive note. I was in love with the fit, comfort and lightness of the boot. I was also attracted by the green image of the company. I remember watching an interview on a financial news channel, where the CEO said ‘although less than 10% of customers considered Timberland’s green initiatives when making their purchasing decision, it was none the less important that company to do the right thing environmentally’ (or something to that effect). Shortly after this, I noticed the soles detaching from the uppers and the fabric begin to tear. Still giving the company the benefit of the doubt, I tried to rationalize this by telling myself “the sole is probably detaching because they use non-toxic, environmentally-friendly glue that isn’t as strong”. I tried to glue it back together and sew up the tears. Everything seemed fine for another week or so and I was almost hopeful the repairs might work. Then I noticed, the fabric tearing again. Distraught and realizing my repairs had failed, I almost threw them away. It was then that I had a brainstorm. I went to the Timberland store in Festival Walk and told the manager about my experience. He told me they would take the boots back and send it to be repaired if possible and if not give me credit. After 3 days I got a phone call. They told me that it wasn’t repairable and that they would give me a credit to buy a new pair (they couldn’t just replace the boot because it was discontinued). I would still need to shell out a few hundred dollars as there was nothing similar (by similar I mean a waterproof boot) available, even in the outlet store, for that price. They offered me some sandals or casual shoes instead. On principle, I have decided that I will not take them up on their offer. A company should stand behind the quality of its product, irregardless of whether it was bought in an outlet store or not. If you sell me a clearly defective product, you should just replace it. These are landfillers, not earthkeepers and Timberland gets our first greenwash rating ever. Previous Previous post: Why is organic food so expensive?